They discussed power market reforms, the impact of distributed energy, corporate clean power procurement and innovation on customer engagement. All foresee that utilising data to better personalise energy services will be the future of the power sector. 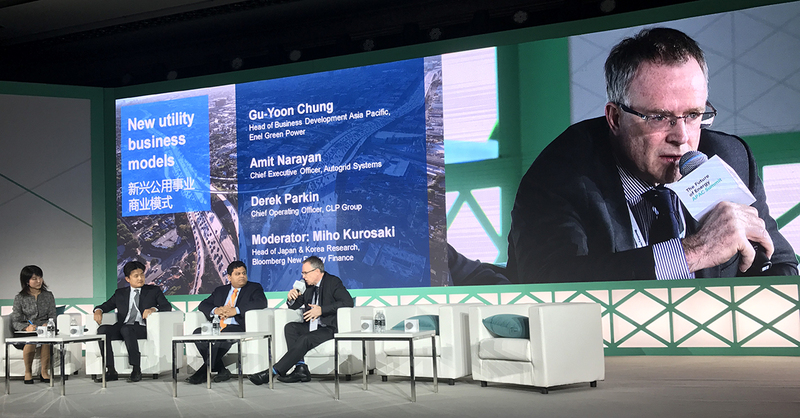 Below are highlights of the exchange between the panelists and BNEF Head of Japan and Korea Research Ms Miho Kurosaki, the moderator of the session. Kurosaki: When the market is deregulated, there are more retailers coming into the market and they are selling perhaps rooftop solar to residential customers. So distributed energy matters. Derek, is distributed energy an opportunity for CLP or a threat to you? Parkin: I guess I’d be lying if I said that distributed energy couldn’t be a challenge or a threat to an existing utility…challenges come with opportunities, so I guess it is a case of mindset. I think certainly CLP sees it as an opportunity. We recognise that there will be people who will want to go off-grid, and who will want to have more control of their own destiny. The whole nature of the relationship between the consumer and the energy company is changing. They are no longer passive and just accept what has been provided. They want to have some control, so we accept that. Our stance is to provide as much help and insight into what that could look like, to provide the convenience as well as the reliability in terms of what they are looking for. Kurosaki: As a utility, how do you balance the grid so that you have more and more viable renewables coming to the grid? Is storage a solution? Parkin: Storage definitely is part of the solution. I wouldn’t say it’s the whole solution. I think that we need to move more towards a smarter grid that, with artificial intelligence, understands these trends and is able to respond far quicker than how the grids are responding currently. But I do think storage does have a role to play. If you take Australia as an example, yes, you’ve got the big example of the Tesla battery. And if you look at the Australian market at any point in time, you can have a big renewable day and you can have a small renewable day, and the difference in the market is quite significant. So the storage that you design for the big days is completely different from that for the small days and how effective battery storage is overall remains to be seen. The other side of that, what we are looking at in EnergyAustralia, is pumped storage, which has a far greater capacity and can last for a lot longer. But then you are talking about significant lead times, during which the market can change significantly. And in a relatively small market like Australia, it wouldn’t take much to change and undermine that particular market, so you have to be very careful in terms of that degree of investment. So in answer to your question, it isn’t all about storage. I think it is a combination of many aspects that is going to bridge this gap between the balance of renewables and conventional energy. Kurosaki: Could you tell us some examples of CLP's business activities when it comes to corporate procurement? And how is CLP procuring renewable energy to corporations? Parkin: It is clearly a market that interests us. We can see an area where we have significant renewable supply and generation such that there is an opportunity to work directly with these so-called corporates. And we see opportunities in India. We see opportunities in China. As China is moving through the energy reform, there is now an over-supply in the Chinese market. So one opportunity is to go direct to corporates, which is an area that we are exploring. So yes, we see it as a clear business trend. We see it as an opportunity to get into demand side management and to be a whole service provider to these corporates. They have got their own business to run and they don't want to be running their energy management. But they want a degree of reliability and sustainability. This is built above and beyond what the grid can probably offer. So yes, it is a clear opportunity certainly here in APAC. Kurosaki: As a renewable energy developer, what are your thoughts on corporate power purchase agreements (PPAs)? Chung: We have been in this space for a couple of years. Our first corporate PPAs were signed in the US, Mexico and Latin America…there are different kinds of corporate PPAs. There are direct supply contracts. There are virtual PPAs. There are hedging contracts…there are renewable energy supply contracts. There are many different things you can do with corporates. It depends on what kind of needs they have. Based on our experience of working with these multinational companies in the Western Hemisphere, they are not coming to us asking for solutions. In other markets like Africa, India and Australia, we are trying to kind of transport these business models into those markets and see how they can work. The challenge that we have had of working with corporate PPAs is that…you don't know if they are going to be around for 20 years or that facility is going to be around for 20 years. How do you manage that kind of risks? What kind of termination clause do you have? Are you indemnified if they are just going to pack up and leave? Or do you need to have a back-up solution and connect to the grid so that you can sell energy to the grid if they are gone? Read the full article on the New Horizons website and subscribe to receive updates on the industry trends.